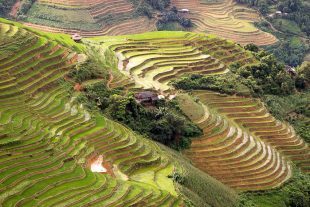 After having visited the Tam Sơn market on Sunday morning, we got back on our motorbikes and set off toward the north… to the very north. Today, Chu Chu would be taking us to Vietnam’s border with China, marked by the Lũng Cú Flagpole. 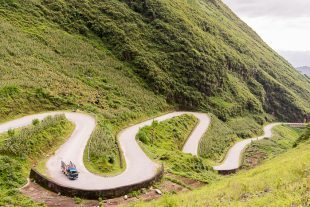 Along the way, we’d see some incredible scenery, especially at the Thấm Mã Pass. 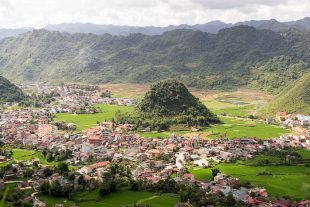 After having visited the Twin Mountains, our tour continued into Lùng Tám, one of the bigger towns in picturesque Quản Bạ valley region. This village of colorfully-attired H’mong people is dedicated to weaving and the fabrication of linen products. 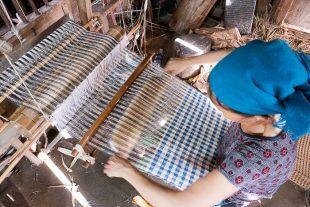 After arriving in Tam Sơn on the first day of our tour around Ha Giang, and before settling into our homestay, we took a trip to a nearby village famed for its linen making. Along the way, we traveled through a valley of stunning beauty, past a pair of hills known as the Twin Mountains.